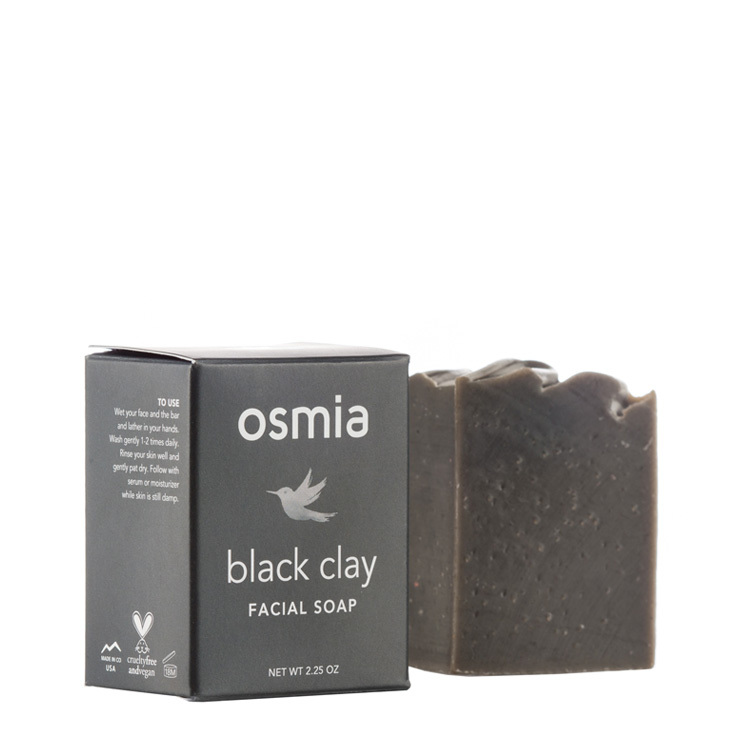 Osmia's signature Black Clay Facial Soap is a mineral-rich blend of Australian black clear and Dead Sea mud that naturally gives skin a super smooth and regenerated feel. Organic coconut milk and mango, avocado, coconut and olive butters leave skin feeling remarkably soft. Lather Black Clay Face Soap between hands with water and wash face, neck and chest thoroughly. Rinse well. Follow with a pea size pump of Purely Simple Face Cream and massage into skin day and/or night. This is perfect for my sensitive, mature, redness prone skin. Other cleansers just irritate me to heck and back. As a bonus this has no plastic packaging and the paper it comes in can be recycled. A little goes a long way. This bar effectively removes mascara as well with only one cleanse. One bar lasts a long time so the cost is justified for me. Since I’ve used this, I have not had any new breakouts (5 months and counting). It’s really squeaky cleanes the face! The smell is nice and clean. Nothing over the top with scent. All around great product. Excellent facial bar - makes my face so smooth and soft! I got this as a sample and was super excited because I had heard such good things about it. I live in a hot climate and have oily skin so I thought this would be perfect. It did exactly what it said it would do - gently exfoliates, and makes your skin super soft. However, I found that this stripped my skin so much. After I would use it my skin would feel tight, stripped and very irritated. I would not say I have sensitive skin, however, something in this seemed to really irritate my skin. I am sure this is a fantastic product but this product did not work for me.